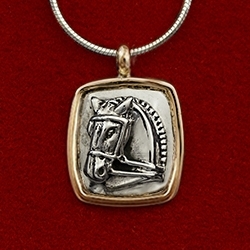 This Classic sterling silver horse head is set on a 14k gold frame and comes on an 18″ box chain with lobster clasp. It measures 3/4″ wide by 1″ long. Available on snake chain also…see below. 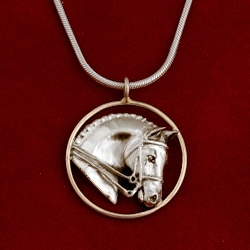 A timeless piece that you will have forever. 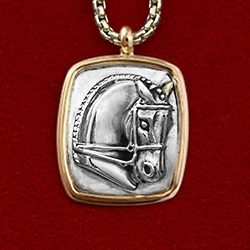 This Classic dressage sterling silver horse head is set on a 14k gold frame and comes on an 18″ box chain with lobster clasp. It measures 3/4″ wide by 1″ long. Available on snake chain also…see below. 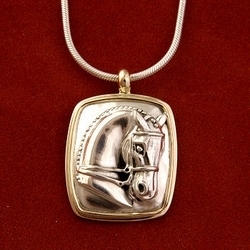 A timeless piece that you will have forever.